Pap (pronounced Pup) or mieliepap (mielie = maize) is the traditional accompaniment to many South African meals. It's basically the same as the grits of the Southern United States: a white (or rarely, yellow) corn-meal (NOT corn-flour) porridge. The difference is that it is left to cool and picked up with the fingers to use as a scoop for other foods. It's called Sadza in Zimbabwe and KwaZulu-Natal, and is basically the same staple cornmeal porridge used throughout black Africa. 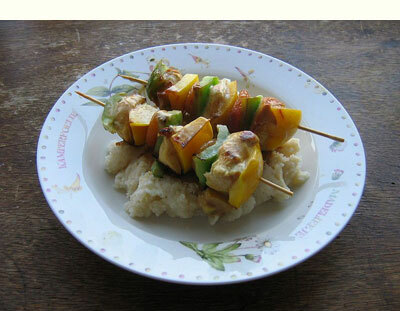 It is very often served at a traditional South African braaivleis (barbeque). Reduce heat to medium-low and continue stirring regularly, smoothing it as you go (it makes huge lumps) until it pulls away from the sides of the pot and becomes very thick, (which is quick). If it burns- throw it away! Let it cool before you serve because it is picked up by hand in big lumps and used as a bread to sop up gravy, pick up meat etc. It's great to have the South African recipe and the names and customs... I love Southern grits, so this gives me a new way to serve them. Thanks to Jeanne Egbosiuba Ukwendu, BellaOnline's African Culture Editor. Some are made in a pot like pap, and some are partially cooked then wrapped in banana leaves and steamed. Ugali (Kenya), kenkey (may have cassava mixed in) and banku (western Africa). Banku and kenkey are made with fermented batter (like sourdough). Bâton de Manioc is made entirely of cassava and steamed. In Zambia and Malawi the term is Nshima, (aka Nsima, Shima, or Sima) and may be made from maize, millet, sorghum, or cassava. Tô, (or Toh rhymes with 'dough') is the version found in Burkina Faso and Mali. It's traditionally made with sorghum flour, but may also be made with maize meal or rice flour. Other names and similar dishes include posho (Uganda), bugari, ghaat, luku, and moteke.